Jeremy Steig's astonishing, trailblazing debut finally gets its compact disk due, 50 years after Columbia released it on vinyl. It was also the debut of Denny Zeitlin, a Bay Area psychiatrist whose singularly imaginative jazz moonlighting has resulted in numerous fearless disks over the past five decades. Backed by veterans Ben Riley on drums and Ben Tucker on bass, the fervent Steig and the marginally less impulsive, if no less creative, Zeitlin alternate standards with classics- to-be by Thelonious Monk, Sonny Rollins and Miles Davis, who, in 1963, were relatively young lionsthough senior to Steig, the son of famed New York cartoonist William Steig. The junior Steig crafted the lovely, sunny cover art and funny cartoons that graced the back of the original vinyl and the inside of this long-overdue CD reissue. Produced by Jonathan Horwich, the reissue also includes an unedited version of "Lover Man" and a second, even more propulsive take of "What Is This Thing Called Love," improving on the original LP. According to the liner notes, Horwich has always wanted to reissue this disk, which he calls "the finest straight-ahead flute album ever made." No argument here. The backstory is fascinating; according to the original liner notes by Willis Conover, the jazz oracle at Voice of America, Steig had a motor cycle accident in 1962 that resulted in paralysis of his face. He managed to get himself together enough to play flute, thanks to a self-designed in-the-mouth device that allows him to blow. And how Steig blows! You'd think he'd taught Jethro Tull's Ian Anderson. The disk, a remastering of the original three-track tapes, launchesthat descriptor is apt with Davis' "Oleo," done hard and breathy by Steig, a vocally oriented flutist whose bridges leave the listener (and apparently almost left Steig) breathlessuntil Zeitlin's appropriately pearly, rapid-fire solo. The version certainly outpaces the Davis original, infusing it with startling energy. Similar praise attends the long version of Sonny Rollins' "Blue Seven," Zeitlin's architectonic and bluesy solo a highlight. After "Oleo," a sensual, understated version of "Lover Man" follows, with Steig at his most caressing, Zeitlin preternaturally patient, the rhythm section all brushwork and laser bass. Pretty, as is "Willow Weep for Me," in which Steig's playing embodies the vulnerability at the heart of the song. No need to parse each track. All the listener need know is that this is a required disk, an object lesson in freshness, daring and improvisation. Both Steig and Zeitlin went on to long musical careers; Steig also played in Jeremy and the Satyrs, a proto-fusion group that recorded for the Reprise label, and Zeitlin is still making CDs. But their moments together, produced by the legendary John Hammond before Zeitlin began recording his own Columbia debut, sound as sharp as they did when they were brand-new. Track Listing: Oleo; Lover Man; What Is This Thing Called Love; So What; Well You Needn't; Willow Weep For Me; Blue Seven; What Is This Thing Called Love? (take 1). 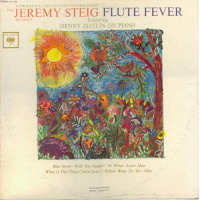 Personnel: Jeremy Steig: flute; Denny Zeitlin: piano; Ben Riley: drums; Ben Tucker: bass.